I’ve not been shy about wishing people Merry Christmas and the like however I have noticed a certain fluffing of lines coming back to me in return. Perhaps our neighbours are sensitive to the fact that we are Buddhist and a bit floored that we would acknowledge Christmas. Anyway I was particularly pleased to read this article, ‘Tis The Season written by a monk of our Order. He too is Merry Christmassing. 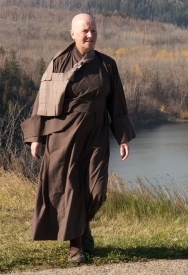 I’d keep an eye out for more articles on Lions Gate Buddhist Priory web site. They will be found under the heading From Dragon Flower Mountain towards the bottom left side of the home page. It has been great to see so many readers turning out to leave a comment. Keep ’em coming. Doing that encourages others to do the same. Good to know you are there still. I am assuming you are the Tim I met, with your wonderful son, this year in Scotland. If not…you might be Tim in Edmonton, in which case…I’m floored! Tim in Edinburgh, not Edmonton! I’ll drop you a line or two in due course and let you know how the wee one is doing…fine of course. Tim W.
So you are in Edinburgh, again? Yes please drop me a line, or three.